HOW Essington ever got beaten in a humble Rockhampton Maiden Handicap was the question on everybody's lips after the gutsy little sprinter scored a course record win in yesterday's $75,000 XXXX Rockhampton Newmarket Handicap (1300m) at Callaghan Park. Ridden by Brisbane's Chris Munce, Essington ($2.00, favourite) was caught wide early before stretching out resolutely in the straight to hold off stablemate Perugin Thought (Paul Hammersley, $11.00) and win by 1.75 lengths. Leader, Favela Star (Robert Thompson, $5.50) fought on gamely for third, a similar margin away. For former Rockhampton trainer Darryl Hansen, who has reached new heights since moving to the Sunshine Coast, the quinella result was a career highlight. “He's the best horse I've ever trained,” a jubilant Hansen told reporters after the race. Previously, Hansen had won the 2008 Newmarket with Onalar but in Essington he realises he has a horse of special quality. Essington's Newmarket win, when having his first start after a three months spell, in such a gruelling race was both remarkable and unprecedented. Furthermore, only one Rocky Newmarket winner in almost a half-century has carried more weight than Essington – Kero carrying 61kg in 1980 on the old Callaghan Park sand circuit. Given his weight burden and lack of race fitness, Essington's new course record time of 1minute: 15.30 seconds is all the more significant. Former Gladstone-based painting contractor Marino Katsenevas paid $50,000 for Essington when purchased from the Lloyd Williams' enterprise in Melbourne last winter. 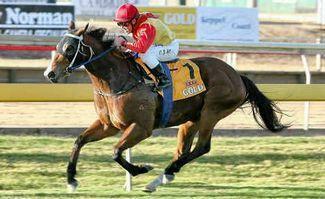 At his first start in the Katsenevas livery of yellow red sleeves and cap, Essington was beaten as a short-priced favourite by Two Bits in a Rockhampton Maiden on July 15, 2010. Since then Essington has won nine races, including four in Brisbane, and brought up $249,300 in stakes making him a marvellous investment for Katsenevas. As for conqueror Two Bits, in 13 subsequent starts she has never won another race. Munce, who no doubt will stick with Essington in their next assignment – the $130,000 Grafton Ramornie handicap (1200m) on July 13 – paid his mount a big compliment. “They (rival jockeys) didn't make it easy for me when wide early. I had to move forward earlier in the race when I didn't want to go too soon. However, I never got fair dinkum with him until the last 400 metres. He is a nice horse,”,Munce said.